Lunchmeat (left) and Johnny Dickie (right). This past Saturday, April 4th, a special pre-festival screening took place at Ardmore’s fantastic video store, Viva Video. Bleeding Skull! 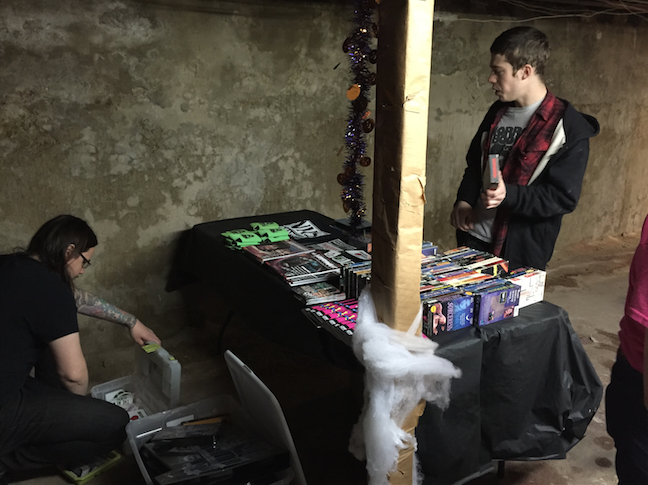 Video specializes in finding super rare, super low-budget VHS horror films and making them available to the world, and on Saturday three films, previously unable to obtain, were screened: Cards of Death (1986), Soultangler (1987), and Run Coyote Run (1987). Local filmmaker Johnny Dickie was in attendance providing introductions to the three featured films, along with the talented VHS preserver, Lunchmeat (of Lunchmeat VHS Fanzine), who co-presented the evening. PhilaMOCA curator and Cinedelphia Film festival founder and programmer Eric Bresler was also there to kick the evening off. 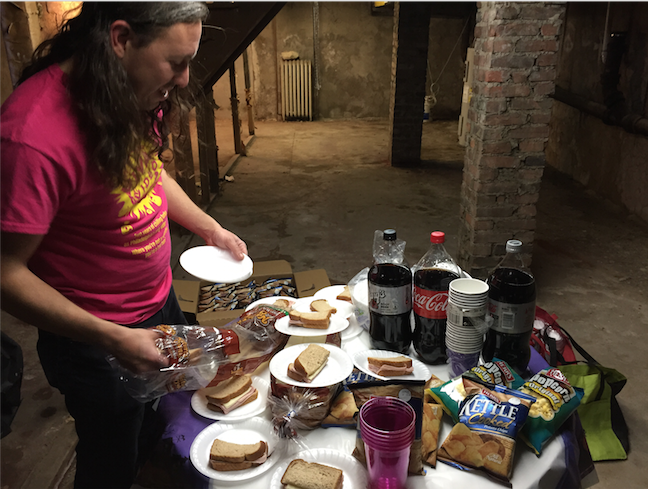 The pre-festival screenings have taken place in Viva Video’s basement for the past couple of years, and Bresler informed the crowd that the first year he introduced the screening there was a dead mouse in the corner. He was pleased to share with the audience that the mouse had returned once again. And so began the marathon of some pretty hallucinogenic, mind-numbing VHS films. Viva Video’s Miguel preparing the ham and cheese. One of the greatest touches of the whole night was the food prepared by Viva Video’s owner himself, Miguel Gomez. Gomez explained that Bleeding Skull! Had given a specific menu of foods to be paired with each film. A ham and cheese sandwich for Cards of Death, spaghetti for Soultangler, and “coyote stew” (or chili) for Run Coyote Run. There was a bit of controversy when one audience member made the bold decision to mix his spaghetti with his chili, but I think people were eventually able to move on. The crowd seemed to really enjoy the low-budget aspect of the films, and each garnered quite a bit of laughs—even some MST3k impersonations. Often, though, people would take a break from the films and stroll around the dimly lit basement and talk, leaving the insanity behind as background noise. All in all, it was an extremely bizarre, but pretty rad night, made even better by a plate of dinosaur chicken nuggets that got passed around.